Local historian, writer and researcher Harold Woodward, Jr. of Madison County, uncovered the story of the Battle of Jacks Shop, which took place on September 22, 1863 in Madison County, VA. Yesterday in Madison there was a Sesquicentennial Commemoration of the battle, which included reenactors from the local area and around Virginia. There were also many displays with people in period costume who described their wares. The Pallas Athena, Ladies Aid Society, had a fantastic display of personal articles that were made available to soldiers on the battlefield, care packages of today. Here are a few of the photographs I took at the campsite, at the cavalry demonstrations and of the displays. We have three horses. Two of them came to our “ranch” almost 8 years ago as 6-month and 8-month-old fillies. The youngest one, Dixie, is a beautiful black Saddlebred/Tennessee Walker mix with white markings on her mane, her tail and her legs. The older one is Molly, and she is a brown and white Saddlebred, half-sister to Dixie. They are as different as night and day. Molly is a lumbering, large, peaceful animal whose only goal in life is to eat. She has almost foundered a couple of times. Dixie is very spirited, energetic and she spooks easily. Almost two years ago we adopted another mare who was rescued from a terrible situation in the middle of one of the worst winters we’ve had in a long time. We call her Pepper because “she is a bit spicy.” Pepper was rehabilitated in an equine hospital, then she went to a foster farm. It was there that we went to claim her as ours. Getting Pepper in the trailer was an amazing feat, but once we got her home, letting her out of the trailer was even more scary. She had never had a halter, and in fact, had never really had human contact. Her instincts told her to run. She ran right into a fence in a relatively small paddock area where she was released, breaking the top board and partially damaging the second one. But, she didn’t get out. With my husband’s tender loving care and a lot of patience, he has turned her into a sweet and loving horse. 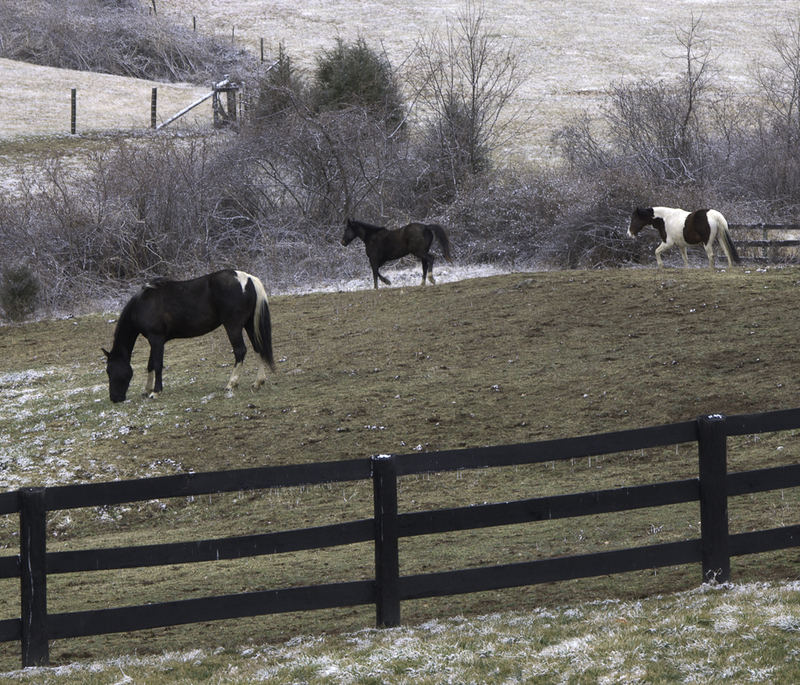 Yesterday, our three precious horses made their way out of our pastures when my husband left the gate open. They always wait for him at the barn in the mornings for their rationing of grain. Yesterday he trusted that they were waiting there as they do every day. So, the gate was left open. The sneaky devils found their way out and took off running through our neighbor’s yard into her eight-acre pasture which is fortunately fenced all around except in the small section they found as they made their entry into her property. My husband took a rope and closed that opening in the fence, then followed them through the fields until Molly lost interest in running. Remember, she is the large, lumbering horse who would rather eat. Putting a rope around her made it easy to lead her back home, and with a little help the other two eventually followed. Problem solved. This is the third such adventure with our horses in eight years and it takes about an hour from start to finish. And, for me, it is a terrifying experience.